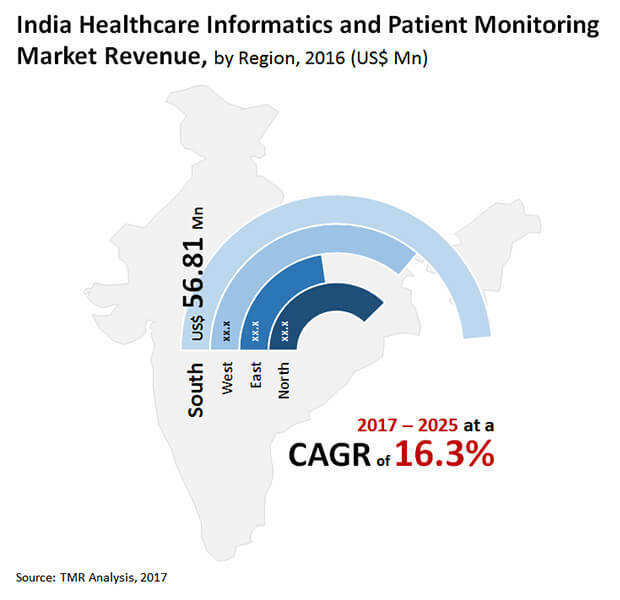 In a fragmented healthcare informatics and patient monitoring market in India, numerous local and international players are competing with one another. In order to steal a march over their rivals, they are said to be expending a lot of money on developing cutting-edge products. This is majorly fuelling growth in the market along with the dearth of nursing staff and mushrooming hospitals and homecare centers. Besides, the alarming increase in chronic diseases in the nation due to the burgeoning geriatric population and changes in lifestyle brought about by urbanization and increasing income of people has also stoked growth in the market for healthcare informatics and patient monitoring in India. Posing a roadblock to the market, on the other hand, is the price sensitivity of the consumer and frequent recall of patient monitors. A report by Transparency Market Research predicts the India market for healthcare informatics and patient monitoring to rise at a robust 16.3% CAGR from 2017 to 2025 to attain a value of US$560.9 mn by 2025 from US$124.7 mn in 2015. Based on demography, the market for healthcare informatics and patient monitoring in India can be broadly split into metropolitan and urban hospitals and healthcare facilities and rural hospitals and healthcare facilities. Of the two, the metropolitan and urban hospitals and healthcare facilities segment leads the market with a mammoth share. In 2014, the figure stood at a whopping 88.0%. One of the primary reasons for the segment’s dominant position is the growing occurrence of cardiovascular and respiratory diseases. Besides, the rising instances of fatal conditions and rising number of beds in tier 1 and tier 2 cities have also helped the segment garner a leading share in the market. The other segment of rural hospitals and healthcare facilities is predicted to progress at a healthy clip in the foreseeable future on account of the rising demand for multispecialty hospitals in rural pockets of the country. Depending upon types, the segment of hospitals accounts for a dominant share in the India market for healthcare informatics and patient monitoring. This is mainly because of the rising number of critically ill patients in India and increasing number of hospital beds. Region-wise, the key segments of the India market for healthcare informatics and patient monitoring are North, South, West, and East. Of them, the South India market has progressed the most to account for a dominant position. This is primarily due to the quick adoption of latest medical technologies, better availability of technologically superior patient monitors, and solid support from the government. In 2015, South India accounted for 39.0% share in the overall India market. Currently, the market in South India is worth US$56.81 mn. Going forward, the Eastern part of India is also likely to contribute significantly to the market for healthcare informatics and patient monitoring, powered by the highly populated city of Kolkata where a large number of people are said to be ailing from respiratory and cardiovascular diseases. Some of the key players operating in the India market for healthcare informatics and patient monitoring are Mindray Medical India Pvt. Ltd., Philips India Ltd., Wipro GE Healthcare, Nihon Kohden India Pvt. Ltd., BPL Medical Technologies Pvt. Ltd., Schiller Healthcare India Pvt. Ltd., Dräger India Pvt. Ltd., and India Medtronic Pvt. Ltd. This report on the healthcare informatics and patient monitoring market studies the current and future prospects of the India market. Healthcare informatics and patient monitoring devices enables monitoring of patient’s health and assists medical practitioners in deciding the treatment regimen as well as track the disease progression during treatment. Patient monitoring is effective in the management of post-acute care and chronic disease. Geriatric population is observed to be at a high risk of chronic diseases such as diabetes, hypertension, cardiovascular diseases and respiratory diseases. Thus, rising geriatric population propels the prevalence of chronic diseases leading to accentuate the growth of healthcare informatics and patient monitoring market in India. The healthcare informatics and patient monitoring market report comprises an elaborate executive summary, which includes a market snapshot that provides information about various segments and sub-segments of the market. It also provides information and data analysis of the healthcare informatics and patient monitoring market with respect to market segments based on the type and demography of end-users and their geographic analysis. Based on demography, the healthcare informatics and patient monitoring market has been segmented into two major categories: metropolitan and urban hospitals and healthcare facilities and rural hospitals and healthcare facilities. Based on type, the market has been categorized into three segments: Ambulatory care, hospitals and home health care. The market segments have been extensively analyzed based on usefulness, efficacy, revenue, and geographical coverage. The market size and forecast in terms of US$ million for each segment has been provided for the period from 2015 to 2025. The report also provides the compound annual growth rate (CAGR %) for each market segment for the forecast period from 2017 to 2025, considering 2015 as the base year. Geographically, the healthcare informatics and patient monitoring market has been categorized into four major regions: North, East, West and South. The market size and forecast for each of these regions has been provided for the period from 2015 to 2025, along with their respective CAGRs for the forecast period from 2017 to 2025, considering 2015 as the base year. The research study also covers the competitive scenario in these regions. A detailed qualitative analysis of factors responsible for driving and restraining the growth of the market and future opportunities has been provided in the market overview section. This section of the report also provides market attractiveness analysis, value chain analysis, Porter’s Five Forces analysis, and market share analysis by key players, thus presenting a thorough analysis of the overall competitive scenario in the healthcare informatics and patient monitoring market. A list of recommendations has been provided for new entrants as well as existing market players to assist them in taking strategic initiatives to establish a strong presence in the market. The report also profiles major players in the healthcare informatics and patient monitoring market based on various attributes such as company overview, financial overview, product portfolio, business strategies, and recent developments. Major players profiled in this report include Philips India Ltd., Wipro GE Healthcare, Mindray Medical India Pvt. Ltd., Nihon Kohden India Pvt. Ltd., Schiller Healthcare India Pvt. Ltd., Dräger India Pvt. Ltd., BPL Medical Technologies Pvt. Ltd., India Medtronic Pvt. Ltd.